Imagine if your working day could be automated and simplified, with up-to-date information constantly available to everyone involved in a construction project. Whether you start with a simple sketch or you import the drawing from another CAD system, you can quickly and intuitively build a complete 3D intelligent model of the project. 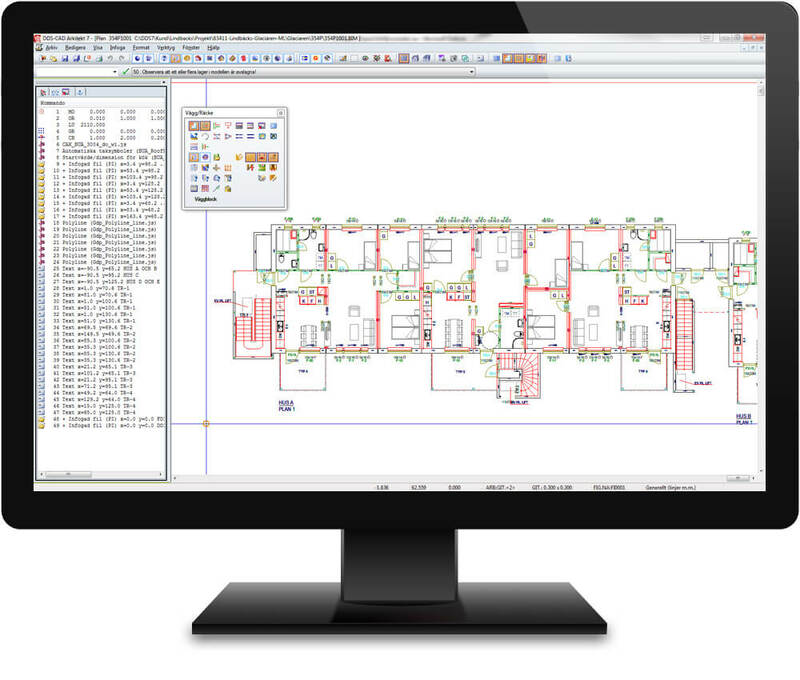 DDS-CAD Architect is based on a three-dimensional planning tool with functions designed to make your life easier and more efficient. The symbol library, menus, descriptions and drawing administration are all tailored for the users and in the local language. The Architect module reduces your workload and helps you work more creatively. It works with your normal thought processes, not against them. You can work your way through a project efficiently using menu options and mouse commands. It is easy to create a 3D model. In DDS-CAD Architect you can directly view the model from different angles. This provides a useful visualisation that is very helpful in the design process. It also provides an ideal basis for discussions with clients, the authorities and other disciplines. The choices you make are instantly reflected on screen – the architect’s drawings and information are used by others later in the project. Descriptive drawings and documentation are essential. The project data is saved securely in a well-ordered system. Small changes – which usually have significant knock-on effects – are applied quickly. This means that the drawings are always up to date. 3D drawings are extremely useful for plumbing and electrical contractors and for construction engineers. The result is better communication, fewer errors and significantly higher quality. Project data saved in DDS-CAD Architect can be used elsewhere and linked to other programs and systems, e.g. estimating and calculating programs, static analysis and verification functions. Communication with other disciplines takes place on a more complete and rational basis. 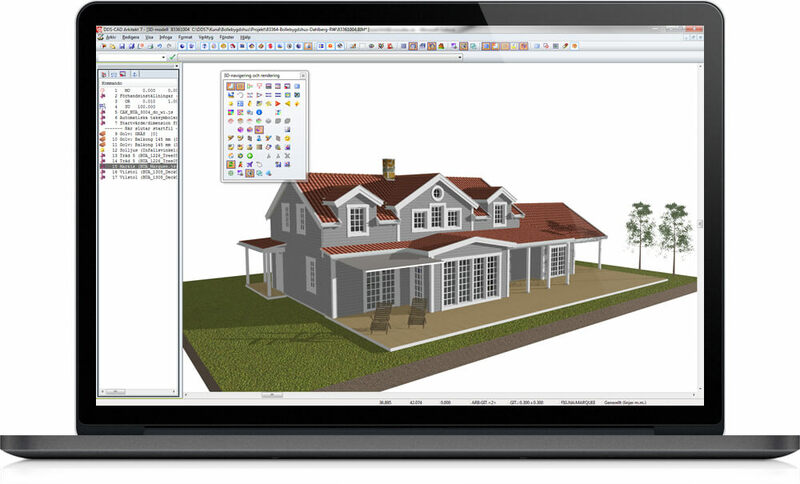 DDS-CAD Construction is a powerful tool that semi-automatically generates 2D and 3D drawings, including cutting lists and bills of materials. All necessary data is taken from the 3D model produced in DDS-CAD Architect or imported from other CAD software and processed in DDS-CAD. The operator is free to choose alternative design solutions and details. The program can show details, add numbers and create dimensions on the basis of these choices. Any necessary changes can be implemented interactively at any time. The design model can be visualised in 3D as a rendered model with or without colours, generating a drawing that is also suitable for self-builders. The data is imported from DDS-CAD Architect and used to generate suggestions, including frame, trimmer and module joists. A simple dialog is used to create the joist floor, and frame, trimmer and module joists are inserted automatically. There are functions for reinforcements, splice plates, tie beams etc. After the joists have been positioned, the operator can interactively adjust them to the structural requirements. For example, adjustments may be necessary around the staircase/chimney apertures, where you can lengthen/shorten the joists or change the dimensions. The joist floor can be dimensioned automatically with functions for dimensioning the body of the building, shafts, joists, boards, mm. You can select special end details for every joist. It is usually desirable to specify these detail references (labels) for module joists that will be joined to a steel beam (HEB). The information will appear in the drawing and in the cutting list. All joists included in the joist floor are sorted by type, dimensions, length, cutting angle, etc., so that identical joists are given the same joist number. The cutting list can be printed out or added to the drawing. The cutting list contains all the relevant information for each joist, such as the type, dimensions, length, cutting angles, detail references, joist number and quantity. The project name, address and date, etc. are also included. You can also produce a separate list of linear metres, calculating the total number of metres of, say, 45 x 195 joists. The roof module handles 2D and 3D presentations. This means it is easy to create a complete 3D design model of the building. You can also obtain elevations of dimensioned ridged with specified hook, start and end terminations for working drawings. The module for floor and roof elements is largely based on the same principle as the stud module – the geometry for the individual element is defined in DDS-CAD Architect and exported to DDS-CAD Construction for automatic positioning of frame, trimmer and module joists, with additional layers for boards, laths, etc. DDS-CAD Construction designed to export timber (joists/studs/laths), insulation and boards to an IFC model. Customised production solutions for floor/roof/wall elements can be created, allowing drawings and lists to be imported automatically. The potential savings are significant, through automatic processes, quality assurance and subsequent control of machines and equipment. Cutting plants and larger production facilities can be managed from the same single data source, for instance production lines for wall, floor and roof elements. This module is suitable for loose timber construction and also for wall element production. The process is highly automated and based on the 3D model from DDS-CAD Architect. On a simplified plan drawing you choose which walls will be joined to other walls. Extra studs are inserted at those points to allow the walls to be fastened to each other. Similarly, extra reinforcement can be added for concentrated loads, beams, roof trusses, etc. You can choose from different corners, wall/door structures, stud dimensions, etc. You can process one wall at a time or all the walls in one sequence. The program can also be used to arrange inside/outside boards, laths and vertical/horizontal panels. Separate drawings of one or more of these wall layers can be combined with the actual stud drawing. Each wall layer can be added individually. All dimensions, such as lath dimensions, panel cuts, etc., are controlled and read from the 3D model. Separate section figures can be used to show details above windows, special studs, etc. A cutting list is generated for each wall. A separate floor list can also be generated, combining all the studs with the same length, etc. A list of linear metres can be generated in the same way, calculating the total number of metres of, say, 45 x 145 studs. The walls can be turned into full 3D drawings – i.e. with the thickness of studs, laths, boards, etc. – and later combined with each other automatically to show a 3D model of the structure. Horizontal sections are very informative, showing how the walls are to be joined. DDS-CAD provides an improved visualisation of the building. You can walk the customer around and inside the building with a photorealistic presentation. You can also include an image of the plot so the customer can see what the building looks like in the landscape. DDS-CAD generates sections, facades, plans, working drawings, lists of quantities and also supports timber walls. The development format for BIMs is IFC. IFC is short for Industry Foundation Classes and is an open, ISO-standard data format. Open means that any software supplier that wants to can include support for IFC. However, suppliers offering software that supports IFC must undergo a strict certification process run by the organisation managing the format, IAI. You have probably heard the terms BIM and IFC. The first is from buildingSMART, and the second is from IAI. BIM is short for Building Information Model. If you are an electrical or HVAC consultant, this means that architects can send you content-rich data models of buildings. A content-rich data model is much more than a 3D presentation. It contains properties such as the room schedule, room surface areas and volumes, room numbers, room names, etc. You can also include properties for floors, walls, windows, doors and ceilings, as well as posts, beams and coverings. In the right circumstances you can even include properties like the U value of all building elements and the normal temperature of each room. Unlike the traditional 2D plan drawing, which consists of little more than line types, colours and layers, a BIM gives you a good start on planning your technical installations as soon as you receive the model from the architect. Elecosoft is a reseller of the DDS-CAD software developed by the Norwegian company Data Design System. For more than 25 years, Data Design System (DDS) has been known for its precision, quality and innovation. DDS was established in 1984 and has now become one of the leading construction software developers in its target group, with more than 12,000 installed licences all over Europe. The company’s approach revolves around product innovation and flexibility with customers, put into practice by a highly motivated team brimming with ideas. Typical customers include timber frame building manufacturers, installers, building managers, industrial buildings and schools, all benefiting from 25 years of development experience with an international company on a solid financial footing. From the early days, the big new idea was to develop an interdisciplinary, database-supported 3D planning system for all technical disciplines, with all relevant calculations built in. Instead of the classic CAD drawing, there is a 3D model which contains all the important data for the various calculations alongside the standard drawing information. There is a smooth flow from advance planning and revision documentation to billing and building administration.